Miami-dade glass - Special safety glass designed to meet high velocity hurricane codes, including the stringent Miami-Dade code requirements. No blind options are available for the 1430 or 1446 size FCM. 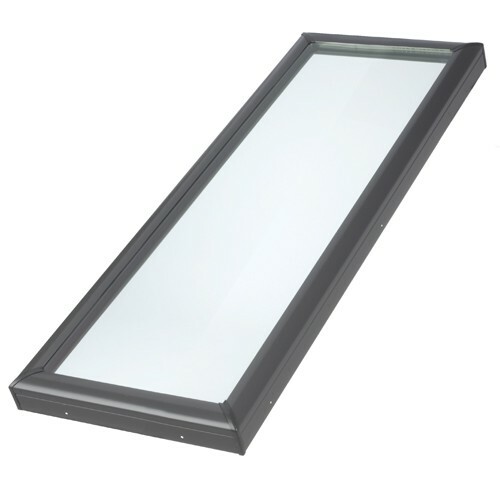 The FCM skylight is designed for simple and weathertight installations on site-built curbs. It features integrated gaskets that provide a thermal break for energy efficiency and seals out water, wind and hassles for years. VELUX ECL step flashing for curb mounted skylights is available for shingles and other low-profile roofing materials only on roofs with pitches greater than 10°. Site-built flashings are required for other roofing materials and roof pitches less than 10°. VELUX ECW tile flashing for curb mounted skylights is available for tile and other high-profile roofing materials only on roofs with pitches greater than 15°. Site-built flashings are required for other roofing materials and roof pitches less than 15°. The FCM skylight is constructed with maintenance free exterior and interior that insulates and strengthens the unit. The video on this page explores the installation process for VELUX curb mounted skylights. If you are interested in a specific installation step, you can select from the scenes listed. This specially designed FCM skylight meets the stringent requirements for Miami-Dade County and the Florida Building Code High Velocity Hurricane Zone (HVHZ). 14 1/2" x 46 1/2"